One of my personal favorites is nothing particularly exciting. A park bench. Wooden, brown, a little old. The view you’ll have from the bench, however, is stunning. Overlooking the Hamburg harbor, you will see ships go by and enjoy the general buzz of the harbor. 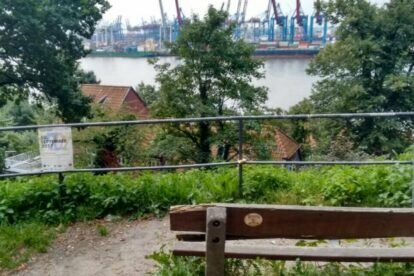 The bench has one little downside – it’s located on the very busy street of Elbchaussee, just above the Strandperle (check the Strandperle article). So you can get a cold (or hot – depending on the Hamburg weather) drink at the beach bar and head up the Schulberg path to the bench. This bench is the best place to relax and watch people and the river pass by. No matter if in the summer or wintertime, my favorite bench offers a relaxing place for everyone at all times. Take a good read for a little timeout or to reset before heading to new exciting places in Hamburg. Or take your friends there for a long talk about beautiful Hamburg – or life in general.